Toronto firefighters are shown in this file photo from Beach Metro News. No one was injured in a fire in a ninth-floor apartment at a building in the Main Street and Danforth Avenue area last night. 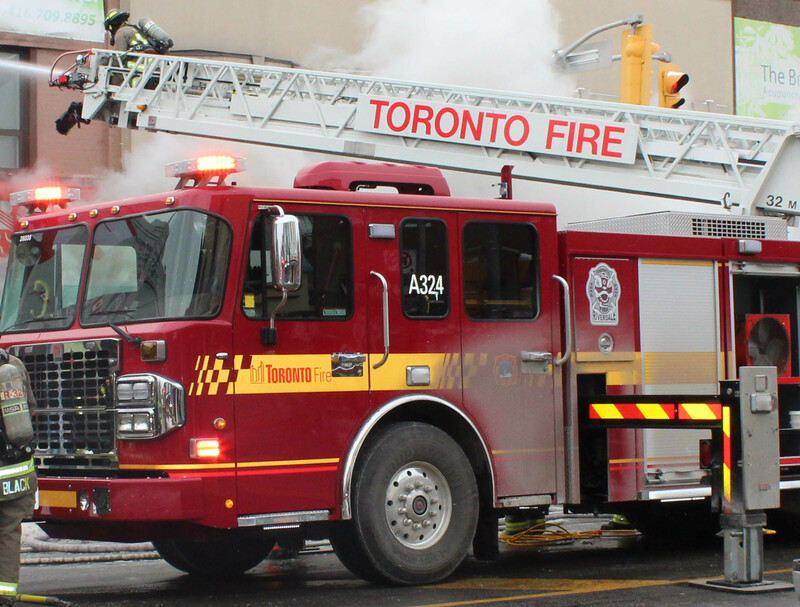 Toronto firefighters were called to a building at 2575 Danforth Ave., Main Square, just after 10 p.m. on April 16 for reports of a fire in an apartment. When firefighters arrived, smoke was visible on the ninth floor and the call was upgraded to a second alarm. Firefighters then entered the unit and extinguished a fire in a bedroom/sleeping area of the apartment. The tenant of the apartment had already safely exited the unit by the time firefighters arrived. According to Toronto Fire, the ninth floor of the building was briefly evacuated while firefighters cleared the smoke. About an hour after the fire was put out, residents were back in their units. Preliminary cause of the fire is believed to be from accidental “improper ignition”. The fire was contained to the unit, and damage including loss of contents and property was estimated to be approximately $20,000.